Viktor has been keeping in touch, he was going to come over but couldn’t get a flight. He does have a point, with carbon frame manufacture, one of the biggest costs is to produce the moulds. This leads a lot of manufactures to go down a ‘one size fits all’ route – meaning a lot of seat post on show and/or stacking/high rise stems at the front end. For me, the classic look of Keisse’s bike is best – extension hard down on the head race and just the right amount of seat pin. The atmosphere was great, again, last night – the track centre is alive. It’s hard to over state how much drink gets put away each night; at the death, the place reeks of pils and the plastic cups make it look like a shanty town tip. The entertainers have all been perfect for the venue; big personalities and big voices – you need those to walk around a velodrome with just a radio mic in your hand. Big Wendy last night wasn’t the best singer I’ve ever heard, but she was a great turn – especially in those boots and that mini. There’s little agro and everyone seems to be having the time of their life. Morale in our cabin is good; Alex and Michael are riding very well; buoyed by the fact that the crowd has embraced them. Franco is Franco, full of fun – last night he rode round plucking flowers from his bouquet and throwing the to the ladies in the crowd – but looking good on the boards. Last night he and Bruno won the 500 metre TT, to the consternation of Iljo’s army of fans. And that’s the podium – don’t ask me the order, except that I’d put Iljo third, with Kluge. Iljo tried to pull a fast one, last night; turning the closing 60 lap sprint series into a chase – he wanted to snaffle a lap, but he all he did was to annoy the other two top teams. Iljo Keisse is the Gent six, just like it used to be Patrick Sercu, then Etienne de Wilde. He’s desperate to win – but it’s natural, he’s a competitor, a winner, and this is his race. Stuart Anthony, Dave Martin and John Anderson were all here, last night – I tried to chat, in between the demands of the job, but it’s hard. There are riders to change, push up into races, haul down after races, drinks to organise, Complan shakes to make, legs to wipe – so, sorry if I neglected you, guys. Pete Jacques is on his way, too – he does management work for Franco and they have some business to talk. It’s a good job that Pete has his tickets organised – they’re like gold dust. Dirk Van Hove – who I first got to know when he helped me with the obituary I wrote for Gary Wiggins – lost tickets that he had for friends. The local newspaper says that at 51 degrees Gent is the steepest track on the circuit; but Michael was saying after he first rode the track that he felt the bankings could be steeper – what he actually meant was that he wished the transitions were better; they don’t propel you back out into the straights, the way the best tracks do. Anyway, it’s 16:35 on Saturday, only two nights to go – but they promise to big ones. 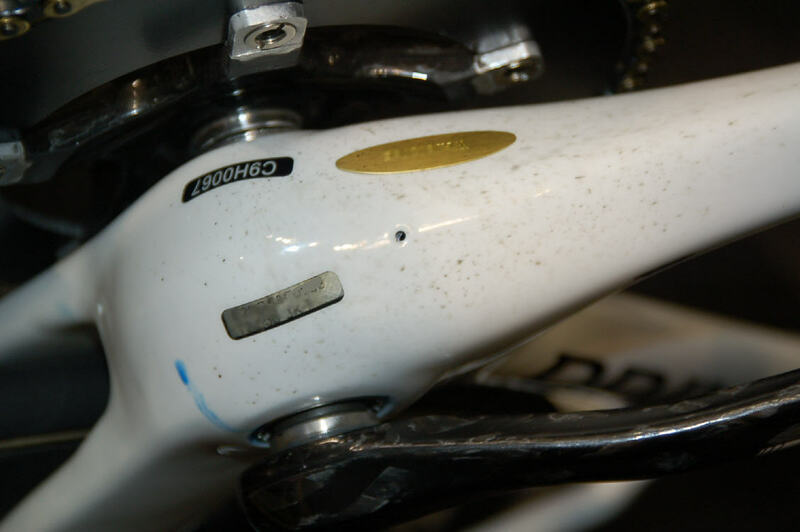 This leads a lot of manufactures to go down a ‘one size fits all’ route – meaning a lot of seat post on show and/or stacking/high rise stems at the front end. For me, the classic look of Keisse’s bike is best – extension hard down on the head race and just the right amount of seat pin. The track was buzzing tonight. See how close the punters are to the cabin? Franco borrows Ed’s camera and takes some pics. It’s hard to overstate how much drink gets put away each night; at the death, the place reeks of Pils and the plastic cups make it look like a shanty town tip. Wendy van Wanten belts out another classic. Franco is Franco, full of fun – last night he rode round plucking flowers from his bouquet and throwing the to the ladies in the crowd – but looking good on the boards. Last night he and Bruno won the 500 metre TT, to the consternation of Iljo’s army of fans. Kluge and Bartko are paired tonight. You need legs like this to win 27 six days. 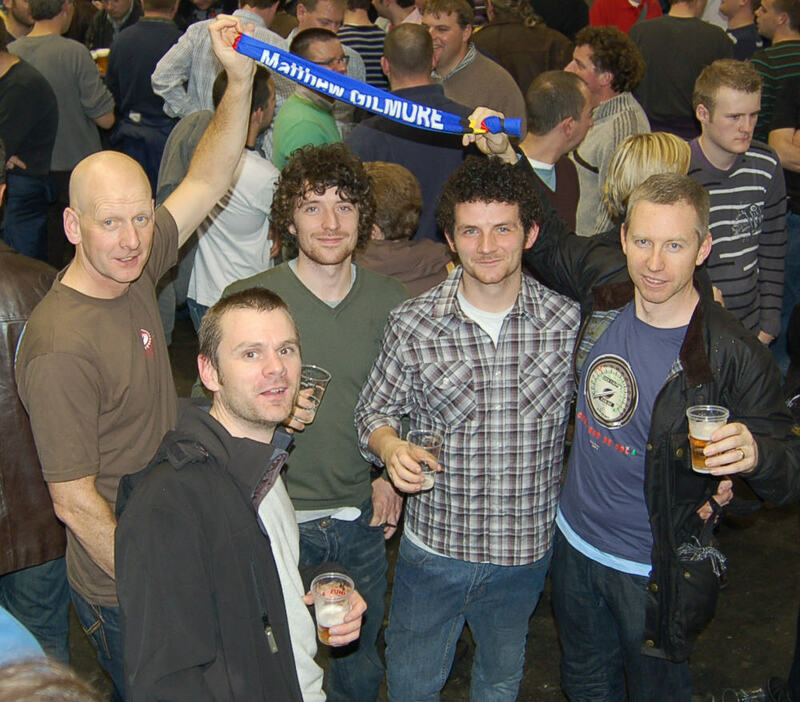 Our pals from Scotland enjoy a beer or three. Pete Jacques is on his way, too – he does management work for Franco and they have some business to talk. It’s a good job that Pete has his tickets organised – they’re like gold dust. Dirk says he wants to go home, but he’s only joking. Ed loves his job. who wouldn’t, when the kit you’re looking after belongs to a World Champion. Photo©Dirk.